You know the trope. Two of any team's biggest fans show up at the football stadium with a "D" sign and a section of picket fence, and they get loud and rowdy every time their squad is trying to force a three and out. 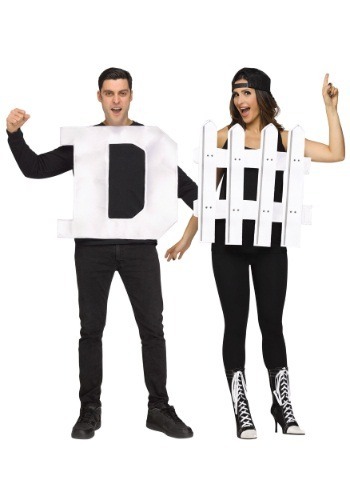 But now you can go as the "D" and the Fence when you get this Adult D-Fence costume set, and you'll have no trouble showing off your fan status with ease! You can wear this set as a couples costume, or team up with your best bud when you are heading to the big game to show your support for the team. And without any of the muss and fuss of having to create your own unique custom signs! This two pack of polyfoam signs fit comfortably around your neck with canvas straps, and they work with any kind of outfit. You can be team-ambiguous with a plain outfit and just show off your love of football at the big party. Or you can wear them with the team jersey of your favorite player to show which team you're backing. But if you really want to go out... they look extra great when you're rocking that head to toe body paint! Everyone loves a stout defense, so make sure you pick up this Adult D-Fence two piece costume for your next game day. We're sure you'll be ready for all of the rock 'em, sock 'em football action! It's ok but a little larger than I expected.. it was fun wearing!